Dollhouses always look better with the light bulbs shining! And thanks to small LED lights, it is getting much easier than it used to be to light up your miniature projects brightly with cool running long lasting simple to connect lights. It has become a DIY project for many! If you are a miniaturist of 1:12 scale and you are working on a small 1 or 2 room project or if you are a Quarter Scale (1:48) miniaturist or Micro Mini scale (1:144) enthusiast, you can easily have all of your Dollhouse lighting battery operated. We have lots of battery choices. To DIY wire your dollhouse lighting to be battery operated, we suggest running the wires for the LEDs along the ceiling, ceilings get fewer looks than the floor or walls. After you have your battery LED light wires in place, cover the wires with a sheet of paper with holes poked into it for the small LEDs lights to shine through. Batteries can be hidden underneath the bottom of the miniature room box diorama or hidden in the "side yard" area, or hide your small battery power in a shrubbery or make a small toolshed. Larger projects including multiple rooms and floors in One Inch and Quarter scale will need more power and are likely to need either a larger battery such as AA or a plug-in power supply such as our 12 volt or 3 volt adapter to run all of their mini LED lights. 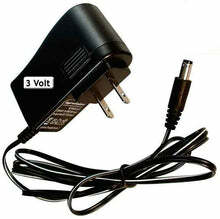 The 1 amp adapter can run 1 to 50 LEDs while the 2 amp adapter can run 1 to 100 LEDs. We sometimes get asked "when would you use a 12 volt or 3 volt adapter to run mini LED lights?" If your project is LED lights only and does not have any incandescent light bulbs or other light bulbs you are fine to use our 3 volt adapter. The advantage of the 3 volt adapter is that colors like cool white and warm white run natively on the 3 volt power and they will not need any resistor in the wires so they will be easier to slip into the Dollhouse rooms. Use the 12 volt adapter if you have anything other than our LEDs to run such as older style lights. this next tutorial covers connecting to a power supply using wires like the branches of a tree coming out from the tree trunk. 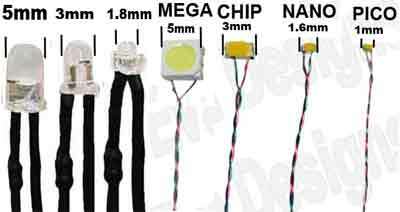 For table lamps and small floor lamps in 1:12 scale or 1:48 scale the tiny LED group that includes Chip, Nano and Pico are great. Most of our dollhouse customers like the warm white LED light color for living spaces. And in the kitchen or bathroom, you might go with Cool White LED lighting. Cool white LEDs are nice to simulate sunlight streaming into the rooms from outside too. If you want LED lights to light up an entire room without the light being in a fixture using out Flat profile Mega lights. Here is an example of a large room with a mega LED light added. The Mega LED light is not "harsh" or focused, just nice and evenly bright. In this picture, a Mega is set 9 inches above the graph paper. The graph paper has 1 inch squares so you can see this one Mega LED light is lighting a big area. The bulb style LEDs like the 5mm give a more focused light, which is also nice when you want to draw attention to a dollhouse room feature. As an example, this lovely 1:12 scale room box has 5mm LEDs shining onto the artwork! You can see the soft puddle of light bringing perfect focus to the elements in the room. There are lots of ways to DIY your dollhouse LED lighting and no one right way to do it!